Evidence suggests that European monks introduced carp into the UK around the turn of the 17th century. Since then, anglers have been studying the carp and its environment as a means of locating and catching the fish. In the 1990s, much work was done to determine the impact of the moon, wind direction, air pressure changes, oxygen content and water temperature on carp behaviour. If the weather conditions change you may catch something much bigger! 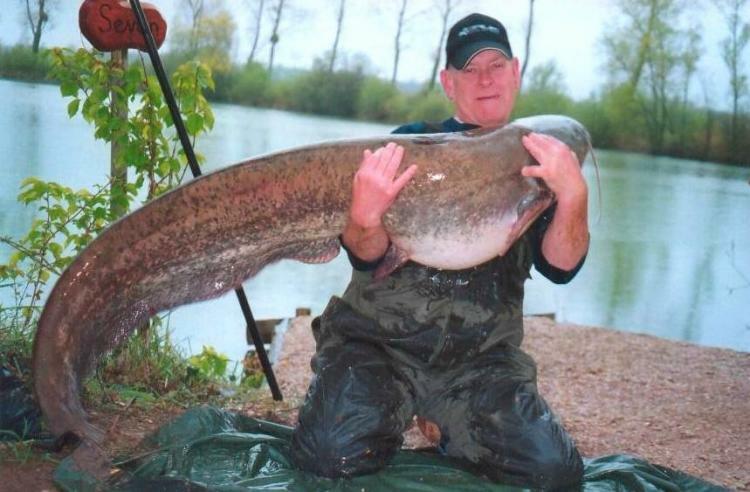 Try to go carp fishing in the appropriate weather conditions or you may end up catching the catfish instead! This beast wrestled Mac into submission. It weighed over 85 pounds - my lucky father! Questions have arisen as to whether the moon phases affect carp fishing. Many saltwater fishermen use solunar tables to calculate prime fishing times. The tables are based on a combination of moon phases and sun/moon rise/set times and rate the various time periods each day. There is some computer software available that can do solunar calculations, but these are usually only suited to North America. It is uncertain how moon phases would affect freshwater fishing as there is no tidal factor to consider. The direction of the wind has a direct impact on the feeding habits of carp. Anglers know that nutrients in the water change direction to match that of the surface winds. Carp follow the nutrients because they can taste and smell items in the water. They have a highly sensitive olfactory system that allows them to sense any dissolved substance in the water and determine whether or not it is a good food source. In addition, the lining of the carp’s mouth contains chemically sensitive cells that allow it to determine whether that food is good or bad. As the wind driven water hits a shoreline, the under-current stirs up food from the bottom, attracting the fish. When the food becomes scarce, the carp will move further from the bank and gradually disperse across the lake to new areas. A change in the wind to a new direction will encourage the fish to move into the windward shore again. It has also been suggested that the wind blows on the fisherman’s line and sends the vibrations down it and that attracts the fish to the bait. When the fish picks up the bait, it feels the vibrations and runs with the line. When the wind stops blowing, the bite doesn't stop but the runs do. When the wind picks back up the runs soon follow. Research has been done into whether barometric pressure has any effect on carp. When the barometer drops, carp tend to stop moving and start feeding on dead materials. When it rises, carp become more active and feed on living things. Today, most anglers know that weather affects the quality of fishing. Poor weather conditions, such as clouds and rain, increase the probability of catching a carp. Rain in warm weather cools the water and increases oxygen levels. This freshens up the water and makes the carp more sensitive to the smell of the bait. Cold weather appears to have the reverse effect. Carp become less excited and more difficult to catch. In clear water under sunny conditions, the carp’s ability to see is excellent, depending on its depth in the water. Cloudy conditions, on the other hand, reduce the amount of light in the water and have the side effect of hiding the angler’s presence. Carp can survive in low oxygen water (0.3-0.5 mg/litre), stagnant pools or waterways or in rivers heavily contaminated by human sewage, industrial and agricultural toxins and wastes. Carp are capable of absorbing large amounts of Mercury, PCB and heavy metals in their tissue. Because of this, they should not be eaten if they are taken from contaminated waters. Carp can also thrive in oxygen rich waters. Changes in water temperature alter the feeding habits of carp. Increases in temperature can significantly reduce the number of fish caught. Where the weather is warmer for longer periods, the feeding patterns gradually return to normal. In such areas, a change of bait is helpful. Boilies made with less casein and more carbohydrate, such as semolina, seem more effective. Smaller and/or softer baits have also been found to get better response. It was once thought that carp could not be caught in water above 21c or in water below 16c. Research indicates that they can survive inside a block of ice with only a small amount of free water in the centre. They can do this because of their ability to modify their muscle properties and swimming performance following several weeks of temperature adaptation. In the cold winter months, carp generally stay near the bottom. A good rule of thumb for winter is to fish at the peak temperature times when the water warms slightly. Carps’ feeding periods will be shorter and less intense than in warmer months. The angler should realize that the fish are far more selective in where and on what they'll feed during the winter. Changes in water temperature have an affect on carp’s spawning habits. Carp spawn in the spring and early summer when the water temperature is around 16-26C. It may take place over several days. The embryonic development of carp takes about 3 days at 20-23C. If hatching comes too close to winter the young carp fry do not have enough time to build up reserves of fat before winter sets in and they perish. Growth is rapid where the water is warm and rich in food. Carp can reach 0.9kg and 15cm in length in a year. They continue to grow at that rate, but not in waters that are too cold (below 10C) to encourage maximum size. The ideal temperature for maximum growth is 20-28C. Al-Hamed, MI. Carp Culture in the Republic Of Iraq. Found in Proceedings of the FAO World Symposium on Warm Water Pond Fish Culture. URL: http://www.fao.org/docrep/005/61036T/61036T10.htm. [Accessed Feb 23 2007]. Dawson, Peter. 1996. Carp-l FAQ. URL: Weather. URL: http://www.carp.net/faq/cfaq_6.htm. [Accessed Feb 23 2007]. URL: http://www.anglersnet.co.uk/authors/matt13.htm [Accessed Feb 23 2007]. Peteri, A. January 31, 2007. Cultured Aquatic Species Information Programme - Cyprinus carpio. FAO Inland Water Resources and Aquaculture Service (FIRI). c2004- . Carp Reproduction - What do Spawning Carp Eat? Do Carp Have Good taste, smell & Sight?